The PSR-EW300 features a wider keyboard with touch-sensitive keys allowing the player to perform more complex pieces with expressive dynamic control. 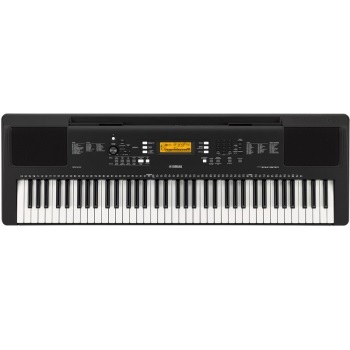 Yamaha keyboards reproduce detailed, high quality instrument sounds that will make your performance come alive. The PSR-EW300 features a comprehensive library of 574 instrument voices and 12 new Reverb effects that will allow you to enjoy playing any musical genre. You can also connect your portable music player to hear and play along with your favorite music through the keyboard's speakers. You can even connect to your computer to record high-quality audio via the keyboard's USB TO HOST terminal. The PSR-EW300 requires six "AA" 1.5V batteries or the PA-130 power supply sold separately.